Some Facebook business Pages lost tens of thousands of fans today, but they shouldn’t fret. Facebook has confirmed with me that it’s currently purging fake accounts and Page Likes as it implements site integrity improvements announced last month. You can see the evidence on Pages like Zynga’s Texas HoldEm Poker whose fan count dropped by 96,000 today after steady after long steady growth. Illegitimately created accounts are being deleted, and Likes gained from malware, compromised accounts, or deceived users are being removed. So no, everyone doesn’t just hate your Page’s last status update. Facebook said “On average, less than 1% of Likes on any given Page will be removed” if they’ve abided by its terms and haven’t shadily been buying Likes from hackers. That matches decreases seen on the PageData tracking service from what I’m calling “Operation Unlike”. 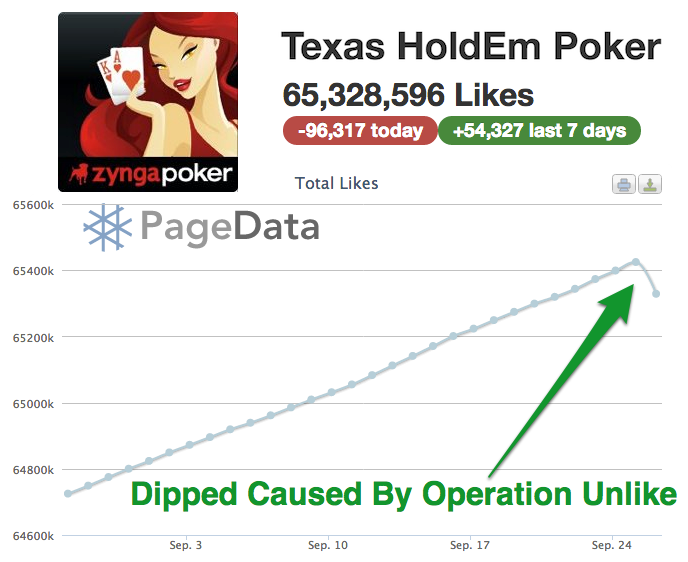 Zynga’s Texas HoldEm Poker, one of the longest standing Pages on Facebook and the third most popular, lost 96,000 of its 63 million fans today, though that’s just 0.15%. Other Pages such as South Park, Justin Bieber, and Leo Messi all had five-digit dips but that only accounted for around a 0.03% total loss. One business owner told us he saw a Page go from 7100 Likes to 5800 in a day, an 18% drop. That’s an extreme, though, and that Page may have been buying spam Likes or tricking users into becoming fans. Lower but more accurate Like counts actually help Pages. Admins might not be able to tout their Pages’ size the same way, but they’ll be better able to assess what content is resonating with their audiences. Think of it this way. If a Page had 10,000 fans but 4,000 were fake and it published an update that got 2,500 Likes, it might think only a quarter of its fans were interested in that content. But with an accurate fan count of 6,000, the admin would know nearly half the fans enjoyed that post and that they should post more with a similar vibe. Meanwhile on the user side of things, the purge of fake accounts means fewer spam friend requests and comments, and a reduced risk of being scammed. Investors will also get a better idea of Facebook’s growth because numbers won’t be inflated by fakes. Facebook is strapped with a tough problem. Its current sign-up process is quick and easy. That’s great for onboarding real people, but it also makes it simple to set up fake accounts. It could be hard deterring spammers without putting up hurdles for everyone else. It’s a pressing issue, though, as Facebook is increasingly trying to convince businesses to buy ads that score them Likes. If businesses worry those Likes are fake and won’t result in real views and clicks of their news feed posts and purchases of their product, they might forego a Facebook fan base. Still, Facebook has come a long way on fighting spam. In made a huge push in 2010 and reduced spam by 95%. Some of that was through smart detection and containment algorithms. However, I’ve also heard there was some awesome counterterrorism powered by humans, where employees tricked bad guys into revealing their best Facebook spamming techniques. Those vulnerabilities were promptly fixed.